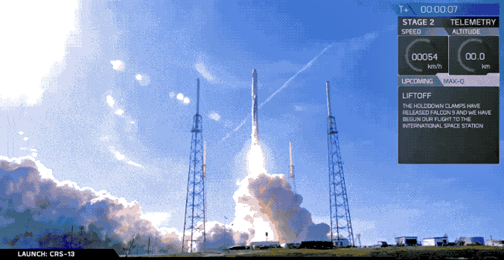 On Friday, December 15, SpaceX's Falcon 9 rocket and Dragon spacecraft successfully lifted off from Space Launch Complex 40 at Cape Canaveral Air Station, beginning SpaceX's 13th Commercial Resupply Services (CRS) mission to the International Space Station (ISS). SpaceX' CRS-13 launch from Cape Canaveral AFS. This mission marks the first time SpaceX has flown both a flight-proven Falcon 9 and a flight-proven Dragon spacecraft in the same mission. 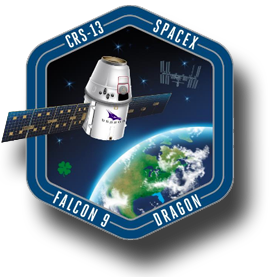 Falcon 9’s first stage previously supported the CRS-11 mission in June 2017 and the Dragon spacecraft previously supported the CRS-6 mission in April 2015. Dragon will deliver about 4,800 pounds of cargo and material to support science investigations aboard the space station. After about one month attached to the space station, Dragon will return with results of earlier experiments, splashing down in the Pacific Ocean off the coast of Baja California in January of 2018. Additionally, NASA is also reporting that this mission will deliver new research to the ISS for investigation. Research materials flying inside Dragon's pressurized area include an investigation demonstrating the benefits of manufacturing fiber optic filaments in a microgravity environment. Designed by the company Made in Space, and sponsored by the Center for the Advancement of Science in Space (CASIS), the investigation will attempt to pull fiber optic wire from ZBLAN, a heavy metal fluoride glass commonly used to make fiber optic glass. Results from this investigation could lead to the production of higher-quality fiber optic products for use in space and on Earth. NASA's Total and Spectral Solar Irradiance Sensor, or TSIS-1, will measure the Sun's energy input to Earth. TSIS-1 measurements will be three times more accurate than previous capabilities, enabling scientists to study the Sun’s natural influence on Earth’s ozone, atmospheric circulation, clouds and ecosystems. These observations are essential for a scientific understanding of the effects of solar variability on the Earth system. The Space Debris Sensor (SDS) will measure the orbital debris environment around the space station for two to three years. Once mounted on the exterior of the station, this one-square-meter sensor will provide near-real-time debris impact detection and recording. Research from this investigation could help lower the risks posed by orbital debris to human life and critical hardware.